My third book, Making Projects Work is now generally available in hardback and Kindle editions. Making Projects Work: Effective Stakeholder and Communication Management focuses on the skills needed by project management teams to gather and maintain the support needed from stakeholders to make their project successful. The underlying premise in the book is that projects are performed by people for people. The key determinants of success are the relationships between people in the project team and between the team and its wider community of stakeholders. This web of relationships will either enable or obstruct the flow of information between people and, as a consequence, will largely determine project success or failure. Making Projects Work provides a framework for understanding and managing the factors required for achieving successful project and program outcomes. It presents guidelines to help readers develop an understanding of governance and its connection to strategy as the starting point for deciding what work needs to be done. 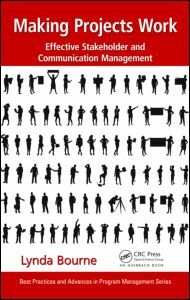 It describes how to craft appropriate communication strategies for developing and maintaining successful relationships with stakeholders. It highlights the strengths and weaknesses of existing project controls and outlines effective communication techniques for managing expectations and acquiring the support required to deliver successful projects on time and under budget.